Meat lovers and vegetarians alike will love this all-natural recipe for shooting the perfect holiday bird. Although Native Americans once feasted on wild turkey, (Meleagris gallopavo), its relative, the domestic turkey, is still a favorite at the dinner table during the holiday season. That said, you don't need to cook this bird to enjoy it — all you need is one good shot, and this photography recipe will show you how to get it. Ingredients: Depends. Are you shooting wild or domestic? A quick way to tell the difference between a wild turkey and a domestic turkey is to look at the ends of the feathers. If the tips of the tail feathers are white, it's a domestic turkey; if they're all black, you've got a wild one. (Click to enlarge) Peachpit editor Ted Waitt shot this turkey (named Gus) at the Oakley Plantation in St. Francisville, Louisiana. For photography we're pretty much sticking with the big male, or "tom," turkey. The female hen is smaller, more timid, and much less colorful. The tom turkey has red, purple, and green iridescent feathers, and when he gets excited his head turns blue. Get him fighting mad and his head turns bright red. Look out! Portion Size: Males up to 48" and 25 lbs. Location: Open woodlands and forests with scattered clearings. Preparation Time: You'll want to plan your shoot for early spring when male turkeys — also called gobblers or tom turkeys — gobble and strut to announce their presence to females and to warn competing males to stay away. Hens will yelp to let the males know where they are. Strutting involves puffing out their feathers, spreading tail feathers, and changing their head color — all of which make for a nice shot. Actual Shooting Time: All day. You must get started early... very early, well before sunrise. And don't plan on coming home until after dark. This is a waiting game. Shooting Instructions: To get your bird, you'll want to call to your turkey from a well-situated blind near the strutting areas of dominant tom turkeys. Calling means you make sounds that will attract the attention of the love-starved tom or get him thinking that a rival is working his territory. 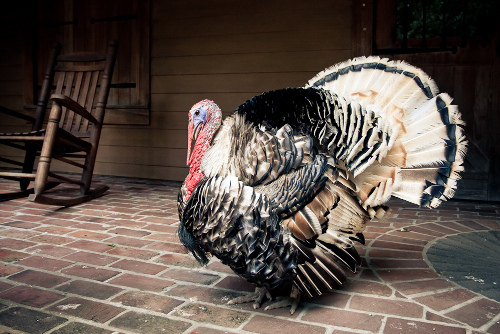 Most people use a variety of "turkey callers," some even imitate the turkey sounds with their voice. The home range of turkeys in the spring breeding season is usually less than 300 acres. So, if you're in country that you know has turkeys, you're almost certain to have one within range of your call. Once you find an area that is known to have turkeys, you can try to follow them through the woods, but you're not likely to have much luck. Turkeys can see and hear you long before you see or hear them, especially in the west, where there's less forest and turkeys are out in the open — where they can spot you from a mile away. If you're in the right area, and lucky enough to hear or see a tom turkey — or even a rafter of turkeys (yes, that's what a group of turkeys is called), you might be able to get a long shot off when they move into a clearing. But to get a closer shot of turkeys feeding, fighting, dusting, and otherwise acting naturally, you really need to use a blind. Some people call blinds "hides," which is much more descriptive of what you're actually doing, hiding. A blind lets you change lenses, move the camera around, and do other things that would instantly cause panic in any sensible rafter of turkeys. Setting up your blind near trees and brush can help make it look like it belongs in the area. Some people will increase their chances of getting turkeys to approach by putting out a couple of plastic decoys. A couple of hens and a jake (an immature male turkey) will usually work well. The gobbler will approach the jake first and circle around to get in front of it. But in order for the blind to work, you have to set it up a few days before you're going to use it. Then, on the day of shooting, arrive at the blind before sunrise, set up your chair, water, food, and camera... and wait. Be sure to constantly check your exposure and adjust for changing light. If the turkey shows up, you have to be ready. Make a couple of turkey calls, and wait. Listen for any response. Nothing, wait some more, make another turkey call, maybe a different kind…wait. If you're lucky, you'll get a nice "gobble or cluck" back after one of your calls. Keep it up, draw him in — but don't be too aggressive. Real turkey calling is an art and requires strategy and knowledge. Turkeys can make a lot of noise; they're constantly clucking, purring, and yelping to each other as they move through the brush. It's this social noise that you can use to get them closer. Yelp, purr, cackle, kee-kee, cluck. There he is... click, click, click. You got him.